If you love new types of travel, then you may find that a ferry ride from Baja to mainland Mexico is just the way to explore Mexico in a whole new way. The primary location from which you can do so is in La Paz, and you will need Mexican auto insurance at MexicanInsuranceStore.com to be sure that your travels are legally and financially sound. As you cross from La Paz, you can choose a landing in Topolobampo or in Mazatlán. You will need to consider a few extra conditions related to your mainland travel as you buy or supplement your Mexico insurance from MexicanInsuranceStore.com. Mexican auto insurance at MexicanInsuranceStore.com is now required in order to drive on any highway in Mexico. You don’t need permission to ride from La Paz to mainland, but you will need a vehicle permit if you are taking your car. You should be able to handle this during your arranging of the trip in La Paz. It’s important to note that permits are required for foreign vehicles entering mainland but not for those entering Baja. Normally, this task would be handled at the Mexican border, but the unique case for ferry riders makes it important to complete this before boarding. Your Mexico insurance from MexicanInsuranceStore.com may vary during your time in mainland as well. Death benefits are different in virtually every Mexican state, and your Mexican auto insurance at MexicanInsuranceStore.com needs to be ample enough to cover your obligations in the state you visit with the highest death benefits. While Baja del Sur has very high limits, some Mexican states have even higher death benefits. If your mainland activities will take you to Guanajuato, Campeche, Nayarit, Yucatan or Coahuila, then you will want to verify that your limits are sufficient when buying Mexico insurance from MexicanInsuranceStore.com. 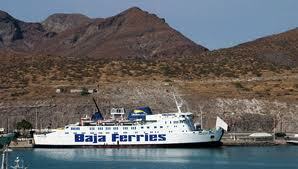 In most other cases, your Baja del Sur coverage is sufficient for the remainder of your travels. It’s easy to cross into Baja from the U.S. without stopping for a Mexican tourist permit. Although you are technically required to obtain a tourist visa for going beyond the border zone, few officials verify your possession of the document. If you decide to take the ferry, this may be required by officials on either end of the trip. Make sure that you check with the ferry service about the possible need. Similarly, it’s easy to cross into Baja without your Mexican auto insurance at MexicanInsuranceStore.com. However, it’s to your advantage to make sure that your policy is intact and up to date. Mexican auto insurance at MexicanInsuranceStore.com comes with FREE Roadside Assistance! Ferry rides are often very intriguing because of the breathtaking views you get to enjoy. However if you are ferrying along with your car a vehicle permit together with Mexican car insurance will be asked of you. Ferry rides are often very intriguing because of the breathtaking views you get to enjoy. However if you are ferrying along with your car a vehicle permit together with Mexican auto insurance will be asked of you. I was in search for low-priced car insurance. I knew it was not easy to locate the right insurance appropriate for my needs. My worries are over. I got now the right coverage I have been looking for. Mexican insurance is all I need.